This course is suitable for children who are completely new to the instrument and is also designed for violin beginners or intermediate level students with little music experiences. World-class violinist, Wilson CHU, will introduce the fundamentals of the instrument to students through straightforward, easy to follow instructions. 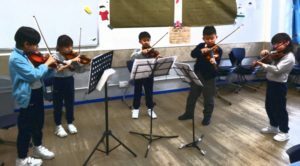 It progresses through Hohmann violin method, custom-made scale exercises and culminated in learning a few simple songs. In pursuit of good intonation and tone production as well as lectures focusing on different violin techniques, students improve their skills on the instrument unwittingly. 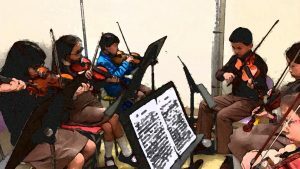 Violin pedagogist, Wilson CHU, has extensive experiences in teaching group classes of students with different levels and learning abilities. The curriculum will be custom-made according to student’s level and ability. For children who are new to the instrument, teacher will focus more on the basics such as the proper way to hold the bow and the instrument. For students with more experiences with the instrument, teacher will focus more on sight-reading, intonation, tone production and ensembleship. This course would work well for anyone that looks for quality violin lesson at a bargain price. It also works well for those already taking private lessons and wanting to supplement their learning experience.